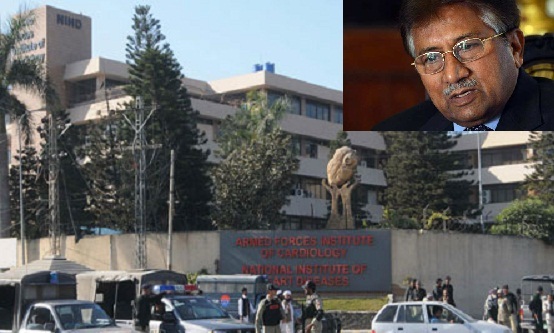 JNN 02 Jan 2014 ISLAMABAD, – Pakistan’s former president Pervez Musharraf who was shifted to a military hospital after he fell sick on way to court on Thursday could be shifted abroad for treatment, local media reported. Musharraf suffered for heart problem when he was heading to the court that is hearing high treason case against him, his defense lawyer, Ahmed Reza Kasuri said. “Musharraf was admitted in a military hospital,” Musharraf’s spokesman Dr Raza Bokhari said in a brief statement posted on social media. “We can confirm that Former President Musharraf is admitted in a military hospital in Rawalpindi, Pakistan. He is conscious, oriented in time and space and is being examined by Pakistani military doctors,” Dr Bokhari, international spokesperson of Musharraf, said. Kasuri told reporters in Islamabad Musharraf wanted to come to the court but his health deteriorated suddenly and was rushed to the Armed Forces Institute of Cardiology in Rawalpindi city. Justice Faisal Arab, who heads the three-member special court, had ordered the former president to appear on Thursday. The judge later adjourned the hearing until Monday. However the judge said the court will issue an verdict on the appearance of Pervez Musharraf. Hospital sources said that the doctors had carried out some medical tests of the former president and the results could later be shared with the media. TV channels later reported that Musharraf could be flown out of Pakistan for treatment on doctors’ advice. As per the Latest development the Medical team of Army Doctor’s are studying His Latest Medical Reports indicate that his Basic arteries are blocked , and he needed an Urgent Open Heart By Pass Surgery , and now they are also working on the Possibilities of Operating him in Pakistan or sending him abroad to London or USA , for a By Pass Operation . It was also reported that he had also a Minor attack ,in one of his tour’s to USA , and he was even admitted to a Hospital in Atlanta , USA , from where he was later released after the Medical treatment and was advised to take special care , and should avoid stress and tension. There was no official word on the reports. Musharraf’s legal team and party leaders are also silent on these reports. Reports said that Musharraf’s wife Begum Sehba Musharraf also rushed to the hospital to supervise medical treatment. She has called her daughter from Karachi to discuss the possibility of sending Musharraf abroad. Musharraf’s name is still on ECL ( Exit Control List ) the list of those persons who cannot go abroad without the government’s permission. A court had already turned down his request to remove his name from the Exit Control List and advised him to approach the government. Section of the Pakistani media had previously reported that some friendly countries are likely to intervene and broker an exile deal for Musharraf. Musharraf’s lawyers had earlier sought exemption of their client from the court’s appearance until Monday. However the judge insisted that he should be produced at any cost. On Wednesday the court had hinted issuance of arrest warrant if Musharraf failed to appear on Thursday. When the court asked about the whereabouts of Musharraf, a senior police officer told the court that he was taken to hospital as he was not feeling well. Deputy Inspector General Security, Jan Muhammad, told the court that Musharraf was on his way to the court but he suffered from some health problem on the way. On the Media News of that Musharaf may have to be sent abroad for treatment ,Different Politicians reacted in both favour and against the decision. While the Politicians who reacted against it includes PPP , PML – N , and ANP Leaders . But as per our Investigation of the Past Records tells that all those reacted against the decision of sending him abroad , have them selves enjoyed the Privliges and have flown to foreign Lands for their Own Medical Treatments and the Most of them were granted Permission by then President Pervez Musharraf Himself , which Includes the Names of Benazir Bhutto, Asif Ali Zardari , Nawaz Shariff , Kulsoom Nawaz Shariff , and Afsandyar Wali Khan. This entry was posted in Asia Pacific, Pakistan News. Bookmark the permalink.